On Nov. 18, a sunny Sunday, the San Blas site looked like this. The longer answer involves — what else? — paperwork and development rules. 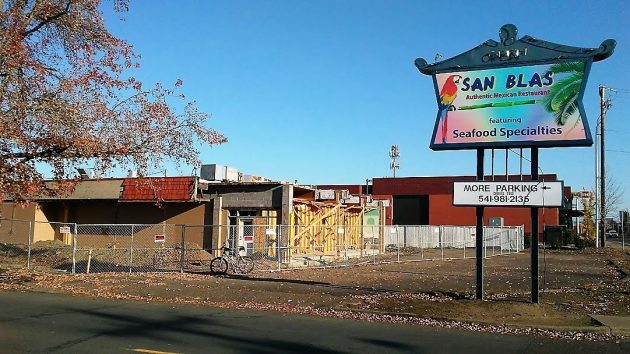 The San Blas restaurant at the address, 2845 Santiam Hwy. SE., has been closed since last year. This August, Northstar Quality Construction of Salem filed for a city building permit in order to put a 3,746-square-foot addition on the building. The permit remained “pending” and had not been issued as of Tuesday. Linn County tax records show the site is owned by Lee Chung Ping and Lai Kuen, who also own Ping’s Chinese restaurant on Ninth Avenue. At the building division, I was told that since work on the San Blas site had already started, the city ordered the work stopped until the permit was approved. But as I understand it, the permit can’t be approved because the size of the planned addition means the project first has to go through the city’s site-plan review process. I had not seen any mention of this in the community development department’s online listing of planning projects. Why not? Because the application for a site-plan review has not yet been filed. You should read Les Schwab’s book where he talks about going to a town and being in business in a week versus today where it takes over a year to get through the bureaucracy. And why would any sane person even consider opening/expanding a business in Albany with a bureaucracy like that in place. Looks like it’s time for a major change in city government to me. But then again, that’s not gonna happen. One would think a simple remodeling of a simple structure in a simple place like Albany would be simple. But one would simply be wrong. Given the results of Albany’s most recent election, it seems the simple folk of this simple city prefer the simplicity of the status quo, vis a vis elected political leadership. Simply put, the citizens, both simple and otherwise, chose to re-elect the very people who’ve presided over the City for some time now. These are the folks who say they’ll simplify, but that simply hasn’t happened. So, the fine residents of Our Simple Community have only themselves to thank for this seemingly simple but apparently intractable situation. You can pretty much open a business in Albany in a day. There is no business license. Rent a storefront, put in your merchandise and open the doors. If you’re transient business or very short term, you need a permit. That’s because they want to be able to track people down who sell garbage and skip town before the law catches up. Ted and Al are just parroting the lies put out all the time by the right-wing. It’s always pretty much that “the government is awful.” It’s not. Need to do remodeling or new construction? Turn in your plans, get permits, and go to town.The story above shows clearly that the owner hasn’t done that. Building permits in Oregon are required under the STATE WIDE uniform building codes. Same applies in counties. The City has some additional requirements as most cities and counties do, but the state requires building permits. In addition, the State has some mandated timelines for reviews, and the performance indicators on the city website says that they have been meeting those 100%. . For Building Inspections the budget shows that they have met the timeframes 100% for performance within the stated policies. If it’s supposedly so hard to build and grow in Albany, how come in 2010 the population was 50,158 and for 2018 it’s estimated to be 53,145 which is a 6% increase over 8 years. That’s a moderate but solid growth rate. Something must be working. Thanks Bob. As always, good information. Some folks consider the various codes as burdensome gibberish intended to keep bureaucrats employed. The reality is that promote public safety. The early code elements were developed one fatality at a time. Granted, that’s a flippant comment; but hyperbole often supports the point. Finally, an inspection is not a burden unless the work is shaky. If someone is afraid of an inspection, they’re in the wrong line of work.